ION TELEVISION is one of America’s top 5 general entertainment networks, reaching 100 million households across the nation. In October 2016, our in-house team relaunched our brand by tightening and refining our logo, bringing in bold colors to take ownership of our syndicated show lineup, and overhauling both our on-air and web presence. ION was already a recognizable network, so we didn't want to make any drastic changes to the logo. Instead, I balanced out the letter widths, tidied up the letter drafting, and switched our secondary typeface to a tweaked Avenir to give 'Television' more real estate within the brand. Breaking away from the orange box gave us the opportunity to build stronger brand ownership and brand recall by assigning a specific color to each of our syndicated shows and carrying it throughout the package, which was something I had done six months prior when I had redesigned the ION website. Its success had initially sparked the rebrand when webpage views had doubled, and time spent per page had nearly doubled. SHOW PAGE: Page views increased by 62%, time spent per page increased by 45%. I worked hand-in-hand with the on-air team to develop the motion, openings, closings, and screen resolves for on-screen. Next, the team interviewed cast about each show, the ION network, and built cross-channel and network spots to promote them. 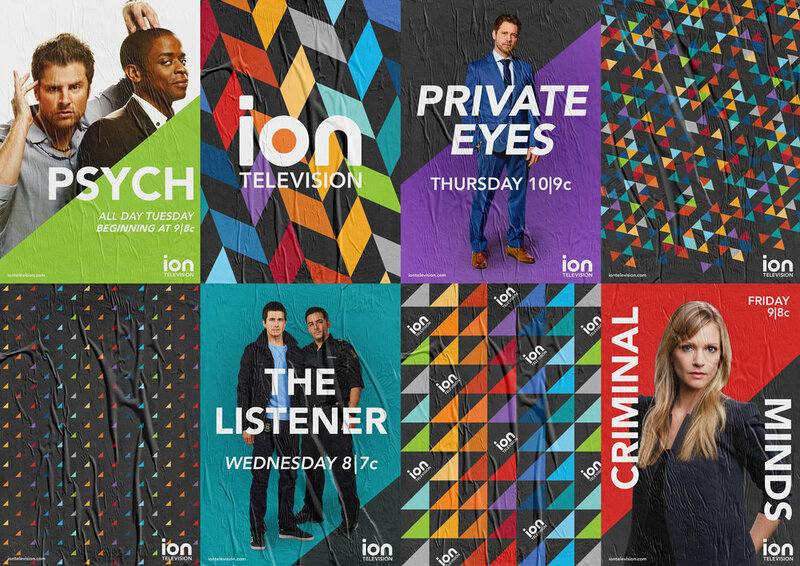 Since the rebrand, ION has climbed to the #5 slot in Prime and Non-Prime, has as many as four times as many viewers of other networks with the same syndicated shows with 95% live viewing and the highest length of tune at 43 minutes. REBRAND REEL: ION went from #8 in Prime and Non-Prime before the rebrand in 2014 to #5 in Prime and Non-Prime in June 2018. SVU ON SET: With a stronger brand recall, ION holds 4x as many viewers of syndicated shows than on the original carrier network or any other network.